"To see a hillside white with dogwood bloom is to know a particular ecstasy of beauty..."
I have had such a difficult time with writer's block lately. Actually, writing has always been secondary to the pictures for me. But lately, I am totally blocked -- nothing to write about, and often, nothing to post about, period. I feel like the most boring person on earth. So, I apologize profusely, but here are some pictures of the Chinese dogwood blossoms from our front yard here at Little Red House. I've styled them with a small silver-plated creamer from the thrift store and some of my favorite antique books. Somehow, books and flowers seem to go together, if only because they are two of my most favorite things. Have a wonderful week, dear bloggers! 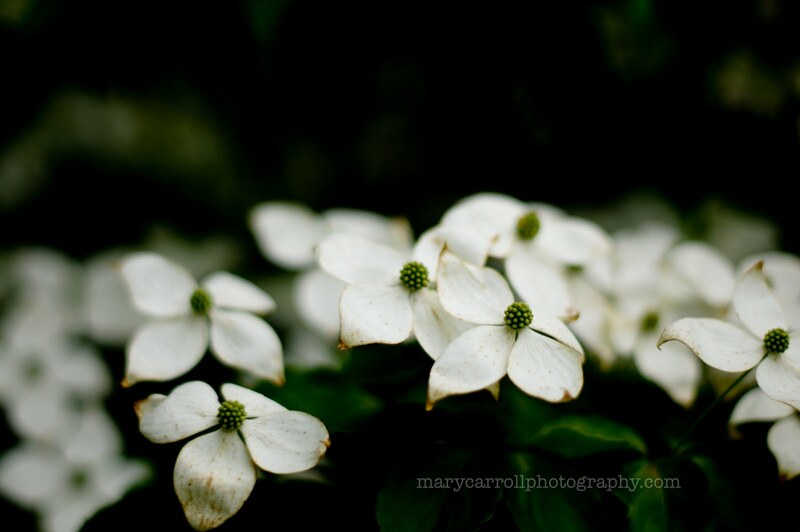 Mary, Your dogwood pictures are so ethereal. It amazes me how you take something beautiful and add dimension and soul to it. I can so sympathize with the writer's block, I am just easing my way back in after a long drought. Your pictures, well, they are always breathtaking. 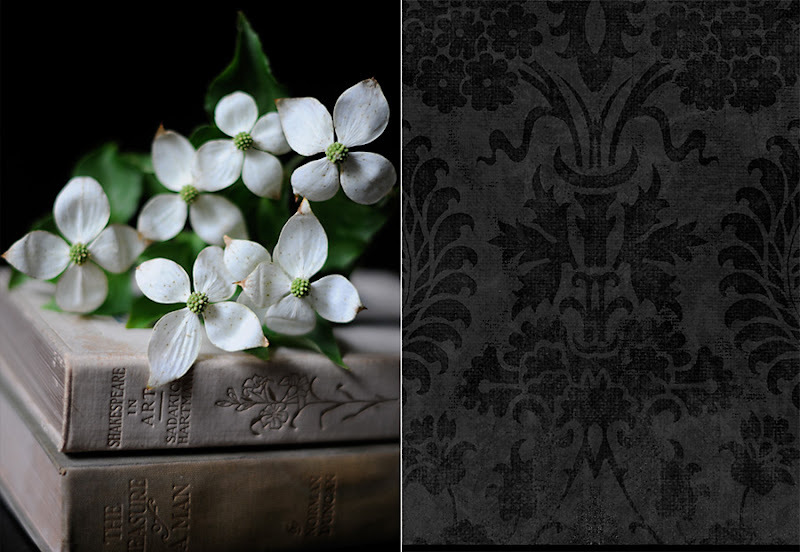 Love your dogwood blossoms on your book stack~ especially with the flower engraving on the spine! Mary, your dogwood blooms speak for themselves. Just beautiful. Thanks for hosting Mosaic Monday, have a great week! I think your Chinese Dogwoods say plenty! Stunning! The dogwoods are gorgeous! Such beautiful shots! This is an amazing arrangement for photos. You a very talented in this for sure. Love that flower. 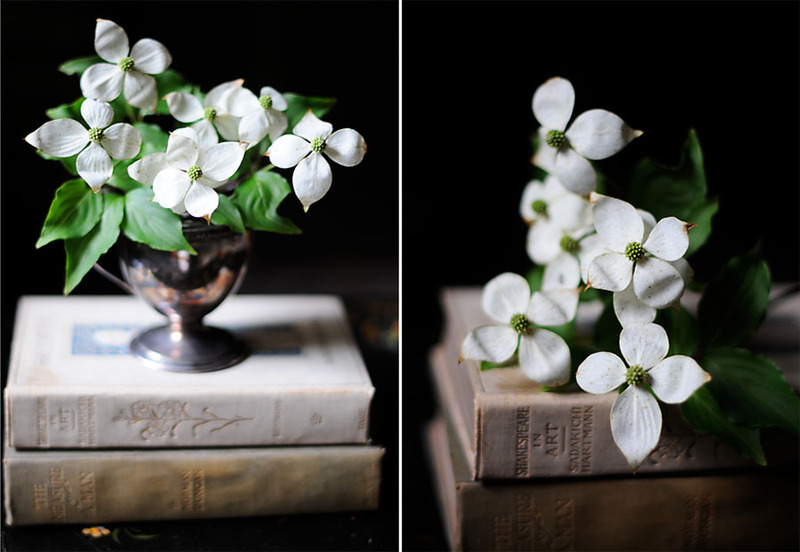 I like the dogwood on the antique books. Your Kousa Dogwoods are beautiful. We have one too and I just love it. Thanks so much for hosting Mosaic Mondays! 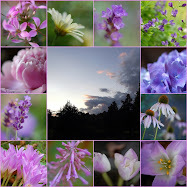 These photos are just gorgeous Mary! I think most of us rack our brains from time to time to put together a meaningful post. 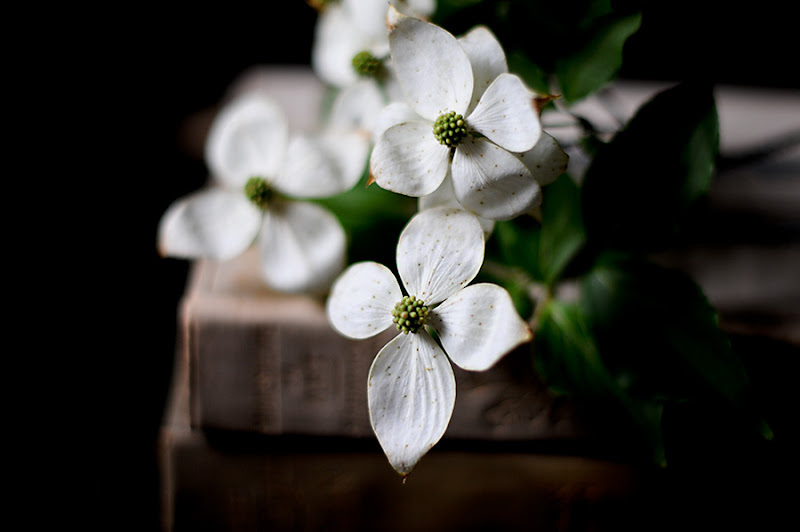 The styling of the dogwood Mary is typical of your ease to create a photographic piece we can all enjoy. What a beautiful dogwood! I have a clematis called Maria Cornelia that has very similar and beautiful flowers. Your photography makes my heart soar. I could look at it all day. Thanks for letting us join in your fun linking party. I vacationed in Virginia and North and South Carolina a few years ago. The dogwoods were all in bloom. It was absolutely breath taking! Stunning photos...Love the dogwood and books together...Your life is not boring, it is tranquil...Just let your mind be still and quiet, you might be surprised what you hear. My favorite combination of green and white! I love the little speckles on the petals. Sometimes words are just too much - and this is one of those times. Today I saw a beautiful old pink dogwood in full bloom - breath taking! LoL, I wouldn't care one wit if I had writer's block if I could take photos like yours! I am just in awe. So hauntingly beautiful. Mary - these photos are simply gorgeous! I would love to know, if you're willing to share, what type of lens you used. I'm so glad I stopped by to read this post on Monday morning...what a lovely way to start the day! Thanks, Elizabeth! I used a 50mm 1.4.
first time in here. wonderful photo shots! As I was opening your blog I thought your photos of the dogwood were breathtaking and marveled at your skill with photography. Then I read of your writer's block and could hardly believe it as I enjoyed this post so much. Yet I do understand. But a boring life---with your ability to see such beauty around you? Hardly !!! No one who takes pictures like these can be boring. Mary, have you ever read "The Artist's Way" by Julia Cameron? Check it out...not for the timid, but oh, so rewarding....smiles. "A picture is worth a thousand words" has been (wrongly) attributed to Confucius. So, how appropriate of you to give us this picture of Chinese Dogwood which is so beautiful that there is no need for explanation. Your photos don't need words - so very pretty. Stunning photos! Love the composition and colors! They would make beautiful paintings! Thank you for so much beauty & joy! Books and flowers going together makes absolute sense to me! That silver pitcher is the final touch to the romance - sigh! You're challenging me to keep looking for beautiful light and to use it! and, no! The most boring person on this earth would be me... I'm so wishy-washy, I can't decide on what photo to even post up. Geesh! Dear friend..as far as I am concerned, you can do no wrong! Your photo's are beyond compare. Mary, I should get over here more often...and there is one person at least that is more boring than you... :) Hello! I went to sleep just checking my own post for errors..